My research agenda has developed toward an exploration of firms as –internally- political entities from both a descriptive and normative perspective. At the micro-level, my focus is on understanding the logic of work in the context of the Western service-based economy, for which I am developing a critical ‘political sociology of work’. 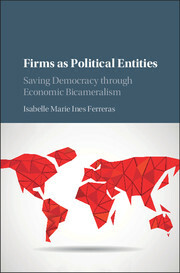 At the institutional level, I am developing a companion ‘political theory of the firm’ that seeks to grasp firms as political entities, and to explore its implications at both the levels of efficiency and normative, and democratic, accountability. My decade-long research into these issues has led me to explore what I call the ‘capitalism/democracy contradiction’; that is, the potential problems that arise when we organize our economy along capitalist lines while nurturing the democratic political ideal of equality for all. I study both normative and efficiency issues raised by this contradiction, combining empirical and sociological research with political theory. As a scholar, I am committed too to helping address the current economic and democratic crisis.